This section covers remnants of two Civil Defense Packaged Disaster Hospitals I located in Mc Kinney, Texas and in Gainesville, Texas. 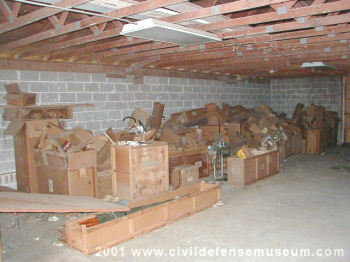 In this section I show some of what I salvaged from the remains of the McKinney, Texas PDH. I wasn't able to salvage any of the Gainesville PDH but it went to the Nimitz Museum in Fredericksburg Texas. I guess this is a bit of a "combination" section that shows what a PDH was to be and what remains of PDHs now. I have combined photos of what I salvaged and some original civil defense hospital equipment photos all through the section of McKinney related items. I don't have any knowledge of medical items or procedures so I tried my best with the photo descriptions. In March of 2001 I spent some time bothering local emergency manangement people to see if any of them kwew about any old piles of civil defense related stuff that might still be around the area. 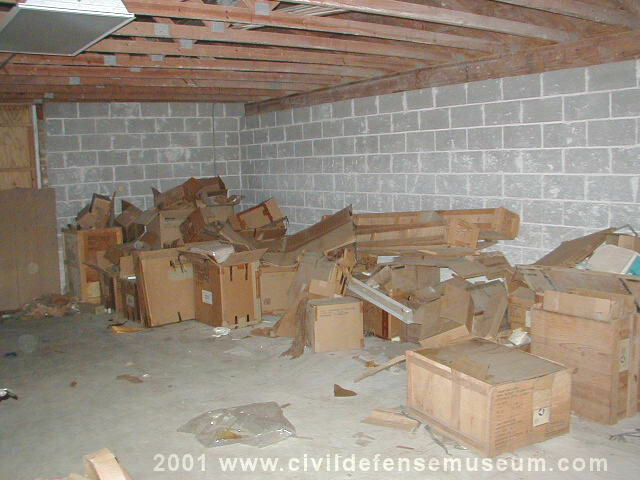 When I contacted the Collin County EM director who, at the time, was the county fire marshal he told me about what he thought was probably the remains of a civil defense hospital they found during a Y2K audit in 1999. They had some old county records of a couple of generators which led them to the North Texas Job Corps Center in McKinney (the Collin County seat) where the old civil defense hospital stuff had been relocated. The hospital stock was originally located at the old Collin Memorial Hospital site on University Drive in McKinney. That building is now gone but the crates and boxes that still had addresses on them were all addressed to that old hospital building. After I spoke to the fire marshal I went out to the job corps center and asked them if they had any old civil defense stuff on site. I told them what the fire marshal said and the man with the job corps center knew exactly was I was referring to. He took me out to a small remote storage building that had a large red "CIVIL DEFENSE STORAGE" sign painted on the door. Inside was a mess. See photos below. These are the first two photos I took of what was left of the McKinney PDH before I started to salvage the stuff. I asked the man with the Job Corps center about the stuff and he said he would have to contact someone official first to make sure it was ok to dispose of any of what was left. I told them to ask various agencies, who I knew wouldn't want any of this mess anyway, to see if they would allow the old junk to be disposed of. Over the next few weeks I contacted the Job Corps center again and they said they didn't find anyone "officially" who wanted the stuff. I got the ok to go through what was there and salvage what I could. This was an interesting shambles of stuff to go through actually. The stock of stuff had obviously been completely ransacked at some time in the past. 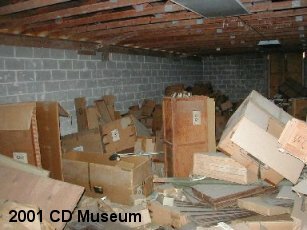 I found cases and items dated from 1958 to 1968 all through what remained of this mess. The few other PDH stocks I have seen were all dated 1957 but those stocks had obviously been stored in remote (see the Gainesville, Tx and Columbus, Tx stock in this section) locations and not maintained over the years. Evidently since this McKinney stock was originally located in an actual hospital it was updated and maintained at least until the late 1960s. The generators that led the fire marshal to this stuff during the Y2K audit were long gone though. Along with the remaining hospital items where was also a decent amount of fallout shelter supplies. Several complete sanitaion kits and medical kits were also in the mess and most were in very good condition. There were also about 80 radiation detection kits which had calibration dates in the 1990s so I knew that the Texas Department of Health (the agency responsible for the kits at the time) would want to know about them. They were all CD V-777 kits and the TDH came and picked them up before I was done with my digging and sorting. The radiation kits were addressed to the McKinney main fire station so they must have moved them up to the storage shed some time in the 1990s. After a few months of digging and sorting. I spent about 50 to 60 hours total digging through the pile of stuff. I arranged what was left so the Job Corps folks would have an easier job of cleaning out the building. The above left picture was taken looking in from the entry door towards the south side of the building. A year or so later all the old buildings were torn down at this site including this shed. 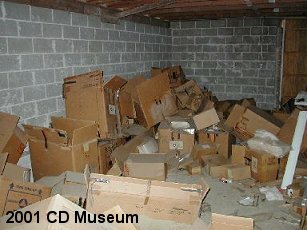 I doubt if this stuff was ever cleaned out. The building was probably bulldozed with everything inside. The above right photo shows the north side of the building after my salvage job. This building had no climate control and wasn't completely sealed from the weather. 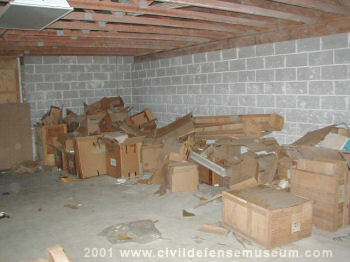 Several of the cases were ruined by ants burrowing into them. All that is left here is junk to be thrown away.